Mongolian folk metal group TENGGER CAVALRY recently released their new Mountain Side EP. This Sunday, May 15, the band will kick off their U.S. headline tour in support of the EP, beginning in Philadelphia, PA at Kung Fu Necktie. The tour will hit 18 cities, closing at Webster Hall in New York City on June 4. See below for all currently confirmed tour dates. TENGGER CAVALRY recently announced the release of their first ever guitar tab book, featuring guitar tabs of band's most popular songs such as "War Horse", "Horseman" and "Hymn Of The Earth". You can get your copy now via Amazon, or download digitally via iTunes. 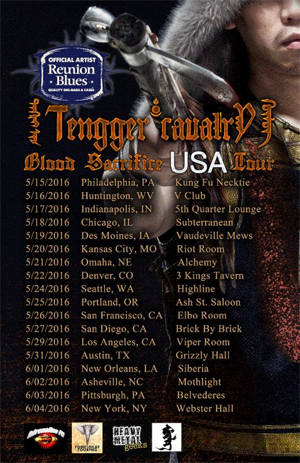 Also available now from TENGGER CAVALRY is a fully acoustic version of their most recent full-length release, Blood Sacrifice Shaman. Download via Bandcamp. While on Bandcamp, make sure to check out ethnic fiddle-player Robert McLaughlin's solo side project. TENGGER CAVALRY's latest offering, Mountain Side EP, features re-orchestrated versions of popular tracks, as well as completely new music accented by acoustic, instrumental and remix versions. The EP also features bonus live tracks and folk recordings. In particular, the re-recording of the band's already popular track "War Horse" still features the traditional Mongolian throat-singing that TENGGER CAVALRY is known for, but has now been completely re-composed and re-recorded to include influences such as Mongolian traditional folk, Native American tribal music, and cinematic film landscapes. TENGGER CAVALRY was recently awarded a Bronze Medal for the EP title track "Mountain Side" as part of the Global Music Awards.